“We hope that this recognition will inspire more chefs to stay in the profession, do more for the country and give back to the community,” says Singapore Chefs’ Association President Edmund Toh. The year 2016 was a golden one for Singapore after Joseph Schooling won a gold medal for swimming in the Rio Olympics. But he shares the limelight and honour with the chefs from the Singapore Chefs’ Association (SCA) who won two gold medals at the Culinary Olympics in Germany, beating 32 other national teams. This achievement is a testament to SCA’s partnership with e2i, which started two years ago. The man in the centre of it all is SCA President Edmund Toh, who led and mentored the National Culinary Team to victory. “Both SCA and e2i share the same objective, which is grooming both younger generation and established chefs, and give them new skills,” he said. 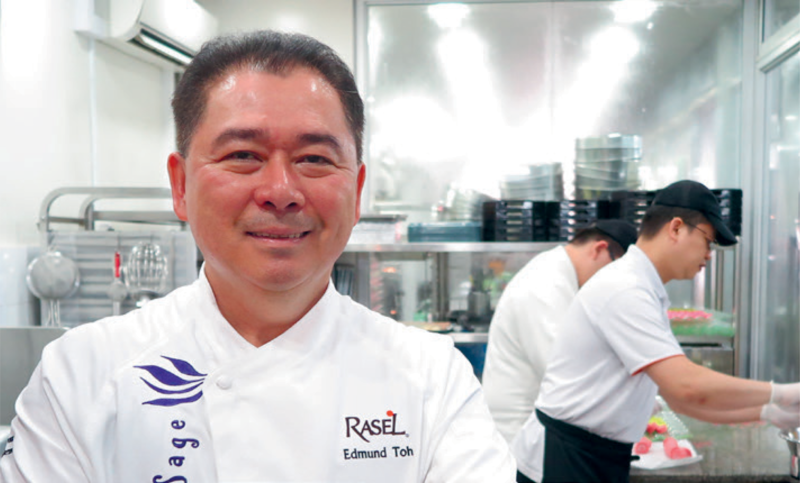 As the culinary director for Rasel Catering Singapore and Purple Sage Group Pte Ltd, and Chef Consultant for The Sapling — the training restaurant for Shatec Institutes — grooming the younger generation of chefs is something Mr Toh personally takes pride in. The collaboration between SCA and e2i was a pivotal platform that allowed the younger and existing pool of local chefs to advance their craftsmanship through competing on the global stage or via skills-related educational programmes, especially amidst the focus of SkillsFuture. “We sent the junior national team to the Culinary Olympics last year to gain more exposure and experience. We also sent another young team, who later became champions at the Alen Thong Young Chefs Golden Coffee Pot Challenge in Abu Dhabi in December 2016,” said Mr Toh. SCA and its members have also been working closely with e2i’s network of partners in the food and beverage industry. Through this collaboration, more than 600 chefs, small- and medium-sized enterprise workers and Food, Drinks and Allied Workers Union members have benefited from the masterclasses curated by SCA and supported by e2i. One example is the Asian Masters 2017, co-organised by e2i and SPHERE exhibits. Held in March at the Grand Mandarin Ballroom, this invitation-only event was graced by more than 200 professionals mainly from the F&B industry. During this event, the Olympic Gold winning team from Singapore Chefs Association was present to prepare food for guests. Apart from networking and product showcase opportunities to learn from each other, there was also a Best Asian Restaurant presentation ceremony.